Bunions can be quite frustrating for patients, especially when they’ve already had bunion surgery once. It isn’t uncommon for initial bunion surgeries to fail, leading to the need for revision surgeries. If your bunion recurs, your foot pain persists, or your toe is uncomfortably stiff, it may be time to talk to a podiatrist in Sugar Land about having a second bunion surgery . Should I consider having a revision bunion surgery? You and your foot specialist will discuss this issue at length. Revision surgery isn’t right for every patient with bunion surgery failure, but it may be right for you if you experience post-surgical arthritis, bone necrosis, compromised foot function, or severe stiffness. Overcorrection and under-correction are also possible reasons for considering a bunion revision. When you’re making your decision, consider the extent to which your symptoms interfere with your daily activities or affect your quality of life. Consider your level of commitment to strictly following your post-surgical discharge instructions. The recovery and rehabilitation processes are crucial for a successful outcome. Your doctor will also consider your overall health when determining if you’re a good candidate for surgery, including whether you have compromised nerve function or blood flow. Are there any additional risks? Yes. Revision bunion surgery is far more challenging than the original surgery. It’s essential to work with a podiatrist who has extensive experience performing revision surgeries, as these surgeries often require fixing the technical mistakes made by the original surgeon. The risks associated with any surgery include adverse reactions to the anesthesia, blood clots, bleeding, infections, and damage to nearby blood vessels and nerves. The risks specifically associated with this surgery include the failure of the bone to heal, problems with blood circulation, nerve damage, and prolonged foot swelling. To obtain a successful outcome for your revision surgery, it’s essential not to rush your recovery. It’s possible that a full recovery will take four to six months. You’ll be asked to keep weight off the affected foot for quite some time, perhaps for six to eight weeks. It’s important to plan your recovery carefully by making any necessary home modifications, arranging for help around the house, and taking enough time off work. Foot and ankle injuries can range from mildly uncomfortable to painfully debilitating. If you have a serious foot or ankle injury, it’s advisable to see a podiatrist in Sugar Land right away. Podiatrists can diagnose and treat all types of foot injuries , including sprains, strains, lacerations, and fractures. In the meantime, you can use some simple first aid strategies to address your injury. Podiatrists strongly recommend the RICE method for treating many foot and ankle injuries, including sprains. This method involves rest, ice, compression, and elevation. When pain develops in the foot or ankle, it’s important not to make the injury worse by continuing to place weight on the foot. Instead, sit or lie down and keep your foot elevated. You can wrap an Ace bandage gently around the foot and ankle, but be careful not to wrap it too snugly. Apply an ice pack for 20 minutes at a time every hour. You can use frozen peas or ice sealed in a plastic bag. Be sure to wrap the ice pack in a towel to prevent tissue damage. If you sustain a laceration to the foot or ankle, stopping the bleeding is a priority. Press a clean cloth against the wound for a few minutes. Then, clean the wound well with soap and water. Apply sterile gauze or a bandage to the wound, and go to your podiatrist’s office right away. Walking around barefoot or in flimsy shoes raises the risk of foreign object penetration in the foot. You might step on a nail or a shard of glass, for instance. If you discover a very small foreign object embedded in your foot, such as a splinter or sliver, you can usually remove it yourself with tweezers. Be sure to sterilize the injury and place a bandage on it. If you have diabetes, you’ll need to see your foot doctor. You should also seek medical help if the object has penetrated deep into the foot or ankle. Your podiatrist will need to remove the object, as you could risk further damage if you try to do the job yourself. Sesamoids are unusual bones because they aren’t connected to any other bone at a joint. Instead, they are either ensconced within muscle or connected to tendons. Although the two sesamoids in the foot are quite small, they play an important role in your foot’s proper functioning. Sesamoiditis refers to the inflammation of the tendons connected to the sesamoids. It may also sometimes involve fracturing of these tiny bones. If you visit a foot specialist in Sugar Land because of acute or chronic foot pain, he or she might consider the possibility of sesamoiditis. If you’ve fractured a sesamoid, your foot pain will develop suddenly. If the tendons have become inflamed and irritated, your foot pain will likely develop more gradually. The pain of sesamoiditis is localized to the ball of the foot under the big toe. It’s common for patients to have trouble straightening and bending the big toe. During a physical exam, the foot doctor might notice visible swelling and bruising. X-rays are usually needed to confirm the diagnosis. If you’re experiencing toe pain, then your podiatrist near Sugar Land may diagnose you with gout. Resulting from a buildup of uric acid, gout is a type of metabolic disorder that can be quite painful. An acute gout attack is associated with symptoms like intense pain, swelling, redness, and warmth around the affected joint. Watch this video to learn more about the basics of gout. When crystallized uric acid gets deposited into a joint where it doesn’t belong, this problem is referred to as gout. This cause of foot pain occurs most commonly in the big toe, and the symptoms can be severe enough to prevent a person from walking. Foot pain caused by gout most often occurs in males and individuals over age 50. As part of your treatment, your podiatrist may recommend lifestyle changes that reduce the amount of uric acid in your body. Pregnancy causes changes to all parts of your body, including your feet and ankles. There are a number of different complaints women have about their feet during pregnancy, from foot pain to swelling, but many of these symptoms can easily be managed. If you are having persistent problems with your feet during pregnancy, see a foot doctor in Sugar Land for help. He or she can recommend strategies to reduce your symptoms and take the pressure off your feet. These tips will also help. Standing for long periods not only causes foot pain but can also cause swelling in your feet and ankles. Avoid standing for extended periods, and when you sit, try to keep your feet up. Rotating your ankles periodically as you sit can also help. If swelling is a persistent problem, try lying on your back with your legs elevated above your head. This can improve circulation from your legs to your heart and reduce the puffiness you’re experiencing. Being active improves blood flow and can help to reduce ankle and foot swelling. Try a daily walk, swimming, or riding a stationary bike. It can also help to walk in a pool, as the water pressure can break up ankle and foot swelling. Simply standing in the pool can also be beneficial. Remember to check with your doctor before you start any exercise program during pregnancy to make sure that it is safe for you. Many pregnant women try to cut back on liquids when they are experiencing swelling in hopes of reversing it. In reality, not drinking enough water and becoming dehydrated will only make swelling worse, as your body tries to retain as much water as it can. Drinking water can actually help to improve swelling, so be sure to get plenty of it each day. The Institute of Medicine suggests that pregnant women get about 10 cups of fluids each day. Ask your doctor what is appropriate for you. People with diabetes have an enormously high risk of foot problems, including neuropathy and ulcers that can lead to amputation. A foot specialist in Sugar Land can be an important member of your diabetes care team, particularly if you are showing signs of nerve damage or frequent foot infections. Watch this video to learn about some of the treatment options for diabetic foot ulcers. 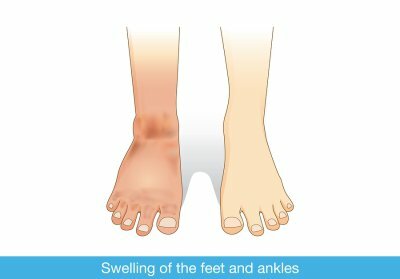 By seeing a foot doctor as soon as possible if an infection develops, people with diabetes can get treatment that can often prevent the infection from spreading to the bone and necessitating amputation. Antibiotics and orthotics that remove pressure from the ulcer are two common treatments used by doctors to control the spread of the infection and control foot pain. Ganglion cysts are masses of tissue that contain a gelatinous substance and appear like a knot below the surface of the skin. They are the most common form of non-cancerous soft tissue mass and occur frequently on the wrists and top of the feet. In some cases, ganglion cysts go away on their own, but in other instances, surgery is required. Because cysts can reoccur after surgery, revision surgery is sometimes necessary. If your foot specialist in Sugar Land recommends revision surgery, here are some questions to ask. Why did my cyst return? Recurrence is the most common complication of ganglion cyst surgery. Although surgery is the most effective form of treatment for persistent cysts, it is still possible that the cyst will return for a number of different reasons. In some cases, inflammation may have prevented the foot surgeon from completely removing the initial cyst, which allows it to return in the future. In other cases, there is no clear explanation for the return of the cyst. Surgery cures between 75-85% of cases . The remaining patients are likely to have a cyst reappear. Is revision surgery the right choice for me? Just because a cyst returns does not necessarily mean you need another surgery. If the cyst is small and not causing any discomfort, your foot doctor may recommend watchful waiting and monitor your cyst before recommending surgery. Aspiration may also be an alternative to revision surgery. Your foot specialist is most likely to recommend revision surgery if there is a clear reason for the recurrence of the cyst that surgery could resolve. The recovery from your revision surgery depends on the severity of your cyst. Your foot surgeon will tell you what to expect, such as how long you will need to stay off your feet and when you can resume your normal activities. In most cases, the recovery will be similar to the recovery time of your original surgery. Ganglion cysts are fluid-filled masses that can cause discomfort. 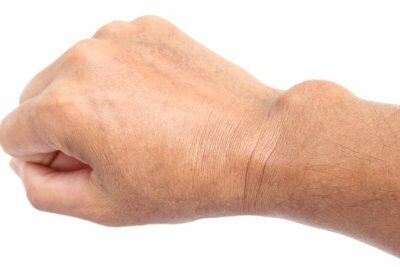 Although ganglion cysts most commonly appear on the wrists and hands, they can and do affect your feet. If you experience one of these common soft-tissue injuries, visit your foot doctor in Sugar Land as soon as possible. Early treatment can often prevent the cyst from worsening and reduce the need for foot surgery in the future. If a ganglion cyst is affecting your feet, here is what you need to know. Doctors are unsure what causes ganglion cysts to occur. Some experts believe that the cysts are the result of some kind of trauma to the soft tissue and that the ganglion cyst is actually a collection of several smaller cysts. Others suspect that a flaw in a joint allows connective tissue to bulge, creating the cyst. In many cases, people who experience a ganglion cyst cannot point to any kind of injury or other occurrence that preceded the appearance of the cyst. The cyst itself, which is usually a soft, unmovable lump, is typically the first sign. Some people also experience aching or throbbing pain. Typically, cysts get bigger over time and may suddenly reduce in size or disappear completely, only to reappear again. Rather than waiting out a cyst to see if it goes away, it is helpful to see your foot doctor when it appears, so he or she can evaluate it when it is flared up. If you have a ganglion cyst, your foot doctor may recommend aspiration. During an aspiration procedure, your doctor will remove the fluid inside of the cyst using a needle and may inject corticosteroids to ease the inflammation. If the cyst is not painful, simply monitoring the cyst may be enough. For persistent and painful cysts, foot surgery may be needed. Foot surgery is the most effective procedure for chronic cysts, which often reappear after aspiration. What Are the Consequences of Ignoring a Bunion? Bunions are painful protrusions that appear on the side of the foot on the joint where the big toe meets the foot base. Although bunions may only be mild annoyances at first, they can grow to require bunion surgery in Sugar Land . If you have a bunion, see your foot doctor as soon as possible. Ignoring a bunion can lead to serious complications. Without bunion treatment, bunions can continue to grow. They will push your big toe inward towards the neighboring toe, which can be painful. Likewise, they can grow so large that is painful to wear shoes. When bunions progress to this stage, conservative treatments are unlikely to work, and you may need bunion surgery. With early bunion treatment, non-invasive remedies can be helpful. Your foot doctor may recommend bunion padding, anti-inflammatory medications or injections, physical therapy, or orthotic shoes. While these treatments don’t completely get rid of a bunion, they can be effective enough in controlling your symptoms and slowing the progression of the bunion that you don’t need bunion surgery. If you’re looking for ways to reduce your foot pain, then you may benefit from bunion surgery near Sugar Land . When left untreated, bunions can cause you severe discomfort and affect your quality of life, but surgery for bunions can potentially provide you with relief from your painful symptoms. Bunions are one of the many possible causes of foot pain. A bunion is described as an enlargement of the MTP, or metatarsophalangeal, joint, which is located at the base of the big toe. If you’re unsure about the nature of your condition, visit a foot specialist as soon as possible to receive a diagnosis and treatment plan. Some of the common symptoms of a bunion include swelling, redness, or pain. You may also notice a firm bump on the outer edge of the MTP joint and restricted motion in your big toe. Your podiatrist may first advise a variety of conservative treatments to address your painful bunion symptoms, such as ice application to reduce swelling, orthotic shoe inserts to offer cushioning and support, and shoes that provide plenty of space in the toe box to avoid aggravating your symptoms. When non-invasive methods fail to address your pain or prevent the progression of the condition, your doctor may advise surgical solutions for your bunions. When you and your doctor determine that surgery is the best option for providing you with relief from your symptoms and repairing the MTP joint, you may be scheduled for a bunionectomy. 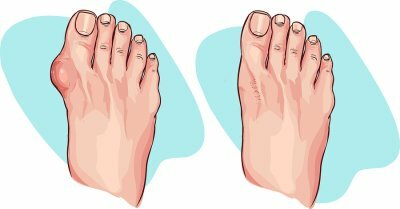 This surgical treatment for bunions is a simple procedure that involves the removal of the bony prominence on your foot and is optimal for less severe cases of bunions. If your bunion condition is more advanced, a more involved surgery may be necessary. This type of treatment usually involves removing the bony prominence and realigning the affected joint. After their procedure, patients usually experience a few weeks of pain and discomfort which can typically be managed using medication prescribed by your podiatrist.